Prague is one of the prettiest cities in Europe. With all its charm, it doesn’t take very long for visitors to fall in love with its cobblestone streets lined with buildings that range from medieval to Art Deco and, in some instances, stunning contemporary architecture. With two million people, this 1,100 year-old city is the capital of the Czech Republic and the historical capital of Bohemia. The Vitava River runs through it, adding to its scenic beauty. Prague is stepped in history as befits a city of its mature status. You can walk your feet off looking at historic monuments and buildings from various architectural periods. You can shop until you drop. You can dine in fast food eateries or upscale fine dining restaurants, as well as everything in-between. Prague is a good place to relax at an outdoor café with a coffee or a beer and watch life pass you by. Most people arrive by plane at Vaclav Havel Airport, about 15 km (10 miles) outside the city. The airport is served by a multitude of international airlines, many of them offering direct flights. Prague also has four big train stations. The main station, Praha hlavní nádraží, is just a few minutes’ walk from Wenceslas Square and Old Town. Prague has a good public transportation system served by subway, tram and bus. The metro and tram are the best ways to get around in central Prague. Bus service mainly goes to the suburbs and outlying areas and do not enter the historic districts to prevent air and noise pollution. 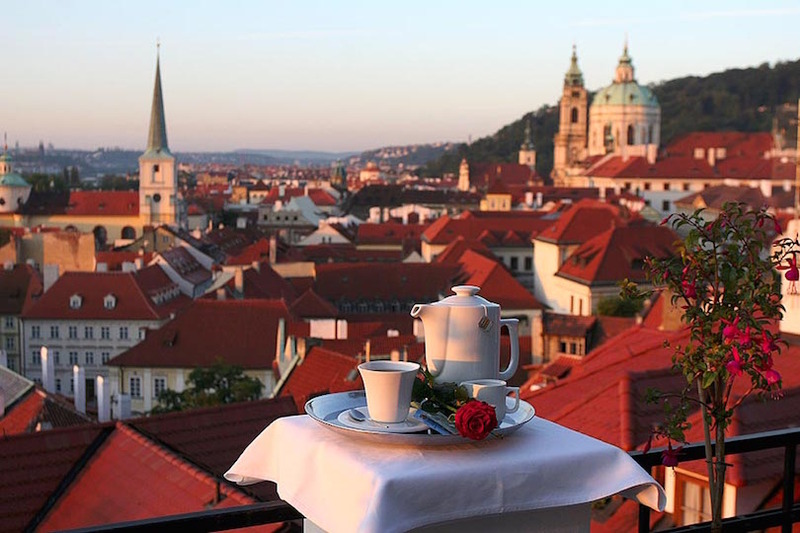 The Old Town has by far the most attractions and is the most popular place to stay in Prague. 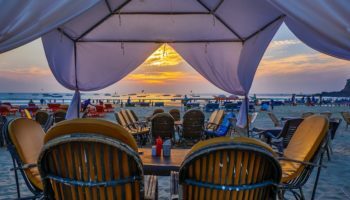 However, it is in general also the most crowded and expensive area while there are several other interesting neighborhoods that have excellent accommodation options. In this guide we introduce the most popular areas in Prague and offer a few recommendations of where to stay in Prague. Why Stay in the Stare Mesto & Josefov area? When steeping yourself in history is important to you, you’ll want to stay where it was made: Stare Mesto (Old Town) and Josefov. A must-see in Old Town is the old square and old city hall’s Astronomical Clock that dates back to 1410. This clock is the pride, not only of Prague, but of the Czech Republic. And don’t forget Bethlehem Square where fancy Baroque houses have been turned into boutiques, antique stores and restaurants. Joselov is the old Jewish quarter or ghetto. It’s been around since the 10th century, with pogroms starting toward the end of the 11th century. It’s named after Joseph II, the Holy Roman emperor who emancipated Jews in 1781. Joselov is located in the northwest corner of Old Town, which surrounds it. It is home to six synagogues as well as museums that trace the history of Prague’s Jewish citizens over 11 centuries. Stare Mesto may be full of quaint alleys and medieval buildings, but it’s also home to designer shops, art galleries and museums, and cellar bars where you can party the night away. Old Town offers the best nightlife of all of Prague’s neighborhoods. Accommodations in Old Town are just minutes away from historic attractions, shopping and nightlife. You can choose from accommodations, ranging from hostels to luxurious five-stars that are housed in buildings from the Renaissance to the Baroque eras. Hotels are housed in newer buildings in Joselov because the Jewish quarter was heavily damaged in World War II. Old Town is made for walking, but if you’re feet get too tired, head to the Old Square and flag down a rickshaw. 1 Powder Tower – Completed in 1475, the Powder Tower, which formerly served as a gunpowder store, is still the starting point for the Royal Route which leads through the Old Town over the Charles Bridge to Prague Castle. 2 Old New Synagogue – The name sounds strange for a building from the 13th century but it was called ‘New’ to distinguish it from an even older synagogue. 3 Tyn Church – The Church of Our Lady Before Tyn, dominates one side of the Old Town Square. 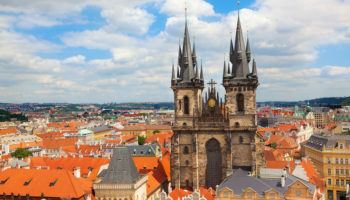 Its distinctive twin Gothic spires makes it an unmistakable Prague landmark. 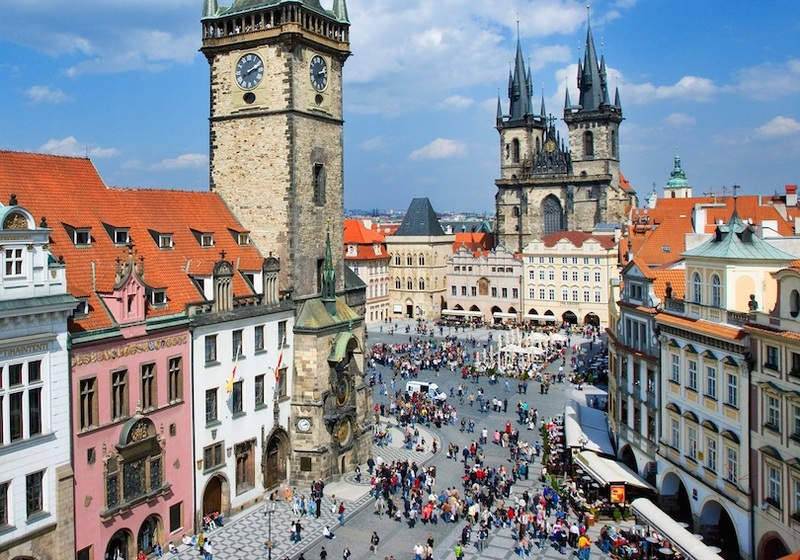 4 Old Town Square – The center of eventful history of Prague, featuring beautiful Gothic, Renaissance and Baroque buildings on all sides. 5 Charles Bridge – Commissioned by Holy Roman Emperor Charles IV and constructed between 1357 and 1402, it connects the Old Town with Lesser Town. 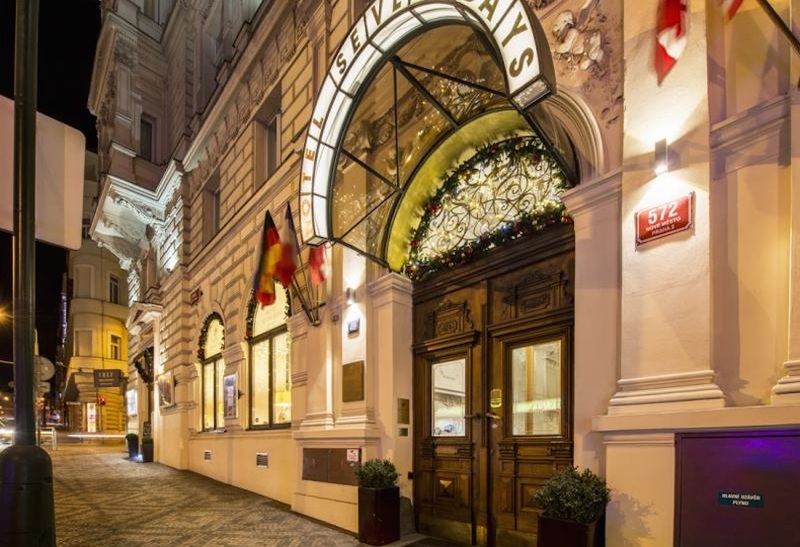 6 Ventana Hotel Prague – Housed in a grand art nouveau building, the Ventana Hotel Prague is the epitome of elegance and sophistication. No detail is too small, and you’ll be awed by the stunning glass chandeliers in the lobby, the impressive stone spiraling staircase and the five-story atrium that houses the hotel bar. The rooms are large and luxurious, and there are even split-level suites with living rooms, four-poster beds and kitchenettes for truly discerning travelers. 7 Grand Hotel Bohemia – The Grand Hotel Bohemia boasts 79 guest rooms in a beautiful 1920s building, and the star of the property is the magnificent neo-baroque ballroom. 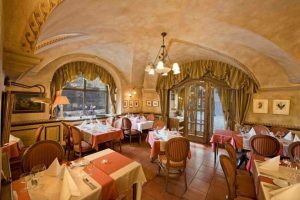 At the hotel’s Franz Josef Restaurant, you can dine on five-star Czech cuisine as well as a handful of international culinary delights. 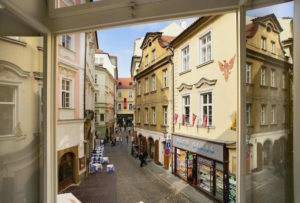 Many of the rooms at the Grand Hotel Bohemia have views of the Old Town as well as updated amenities like iMac computers and Nespresso machines. Additional perks for guests include things like complimentary use of a nearby fitness center and spa as well as free public transport cards to get around the city. 8 Hotel Kings Court – The Hotel Kings Court is located in what was once the Czech Chamber of Commerce, adding an extra level of prestige and history to the neo-Renaissance structure. This hotel is epitome of luxurious comfort, offering wonderful touches like quilted headboards and terraces with views of the city. You will appreciate the onsite spa, the casino and the restaurant, which is known for its impressive cuisine and equally appealing terrace for al fresco dining. 9 Hotel Residence Agnes – Nestled on a narrow, pedestrian cobblestone street is the Hotel Residence Agnes, which is a favorite for travelers who want plenty of history and culture without splurging on an expensive hotel. The Hotel Residence Agnes is easily recognizable thanks to its pink stone facade and its dormer windows, but the interior is just as appealing. Rooms are decorated with rich wood, luxurious textiles and extras like complimentary wifi and modern flat-screen televisions. 10 Savic Hotel – The Savic Hotel in Prague is located within a building with Gothic and Renaissance design features, and it boasts parts of the original ceiling that date back to the 14th century. The entire hotel is non-smoking, and the property offers onsite dining at a stunning restaurant equipped with an outdoor dining terrace. Free breakfast is available for all guests, and you will love the beautifully decorated rooms and suites, some of which have four-posted beds and even original painted frescoes on the walls. 11 Design Hotel Josef Prague – In a city filled with historic buildings, the Design Hotel Josef Prague is decidedly different, thanks to a striking, modern facade and the use of glass during construction. The rooms are just as sleek and contemporary, so expect glass bathrooms and a restaurant complete with floor-to-ceiling windows. 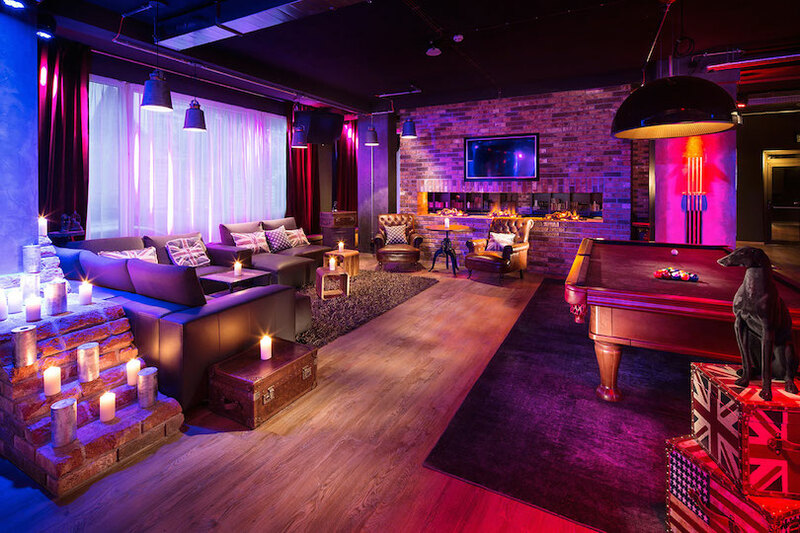 Revel in the luxurious amenities that range from a spa to a bakery to a vibrant bar that is popular most evenings with locals and hotels guests alike. 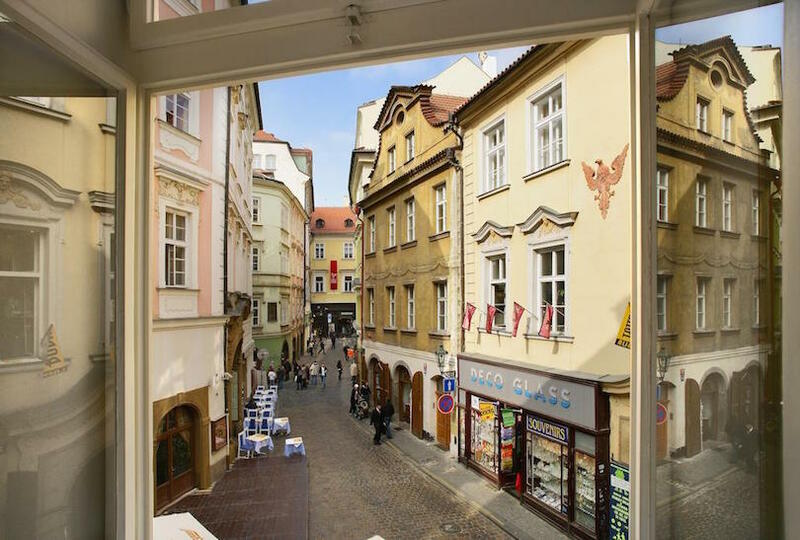 12 Ibis Praha Old Town – The Ibis Praha Old Town is the ideal accommodation choice for travelers who are on a budget, but who still want to experience a central location in the city. The rooms are contemporary and straightforward, offering comfortable white bedding and light wood paneling. You’ll have access to a small but functional business center by day, and the lobby bar is a wonderful place to hang out and nibble snacks or sip drinks while discussing the next day of sightseeing in the city of Prague. If painting the town red isn’t your lifestyle and you prefer to sleep where the nightlife isn’t so raucous, you may want to stay in a quieter neighborhood. You might also want to stay elsewhere if masses of tourists visiting Old Town make you nervous or you’re looking for an area that is less touristy. 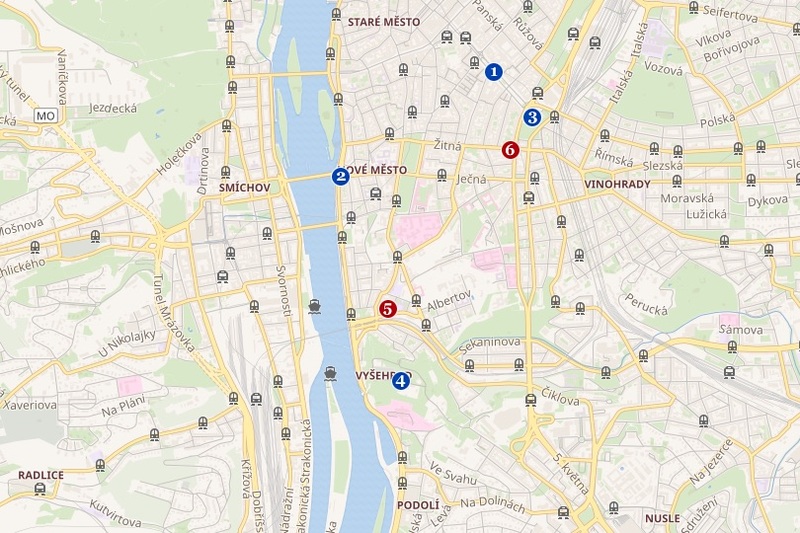 Also keep in mind that, because Stare Mesto is so popular, prices for everything, including lodging and restaurants, are higher than other districts. 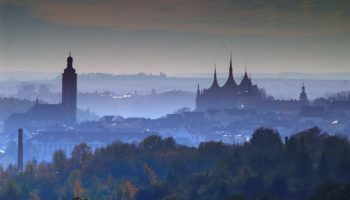 Why Stay in the Nove Mesto & Vyšehrad area? Nove Mesto translates as New Town, which might mislead you into thinking it’s a relatively new town. Hardly. It was founded in 1348, which doesn’t make it all that new. Rather it gets the New Town moniker because it’s the youngest of the five towns that make up historic Prague. Not many buildings survive from its founding days, but you will find awesome gothic and baroque buildings. 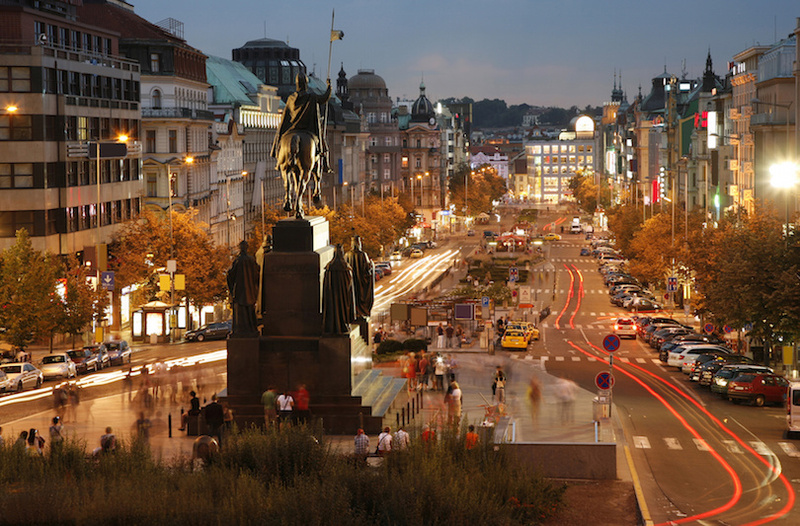 Nove Mesto’s most famous landmark is Wenceslas Square that started out as a horse market, but now is a center for tourism. Vyšehrad is a few centuries older than Nove Mesto, dating back to the 10th century. The name translates as “upper castle” or “castle of the heights” as it contains a historical fort on a hill. On the edge of Nove Mesto, it is home to the Czech national cemetery and the Rotunda of Saint Martin, one of Prague’s oldest surviving buildings. 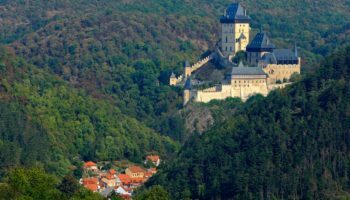 Historically, it is considered the place where Czech rulers got their start. Vyšehrad is a great place for a walk in a park or see stunning views of Prague, especially at night. If you go there at night, it’s recommended you have a local or someone who’s been there before to help you orient yourself. Whereas Nove Mesto is considered mostly a business district, Vyšehrad is considered a high-priced residential area. This means you can expect to find more upscale, more expensively priced accommodations. 1 Wenceslas Square – More a broad boulevard than a typical city square, Wenceslas Square is the commercial and administrative center of Prague. 2 Dancing House – The work American architect Frank Gehry, and is said to be shaped like a man and a woman dancing, hence its former name “Fred and Ginger”. 3 National Museum – A huge nature and history museum in the upper part of Wenceslas Square. Prominent Czech neo-renaissance architect Josef Schulz designed the building. 4 Vyšehrad fortress – Site of St. Paul and Peter’s Cathedral, and of the famous Vyšehrad cemetery known as ‘Slavín’, burial grounds of extraordinary Czechs. 5 Park Inn Hotel Prague – The Park Inn Hotel Prague is nestled in a building from 1907 that was built in the grand Art Deco style. The facade of the hotel is beautiful, but the real highlight of staying at the hotel is spending time on the room. The Park Inn Hotel’s roof is complete with a business center and a fitness center, both of which allow for sprawling views from the roof across the city of Prague. Many of the recently upgraded rooms boast separate living rooms and terraces, and all rooms offer minibars, safes and wireless Internet. Don’t leave before trying the upscale Czech cuisine in the onsite restaurant. 6 Boutique Hotel Seven Days – Found within an art nouveau hotel built in the 19th century, the Boutique Hotel Seven Days is a beautiful accommodation choice in the city. The inside is furnished in the Italian neoclassical style, boasting rich colors and luxurious textiles. Amenities for guests include things like a gym, a spa, hot tubs, a casual bar in the lobby and an upscale restaurant for fantastic evening meals. Because this is an upscale area, budget accommodations, including hostels, may be more difficult to find. Wow! What a castle! 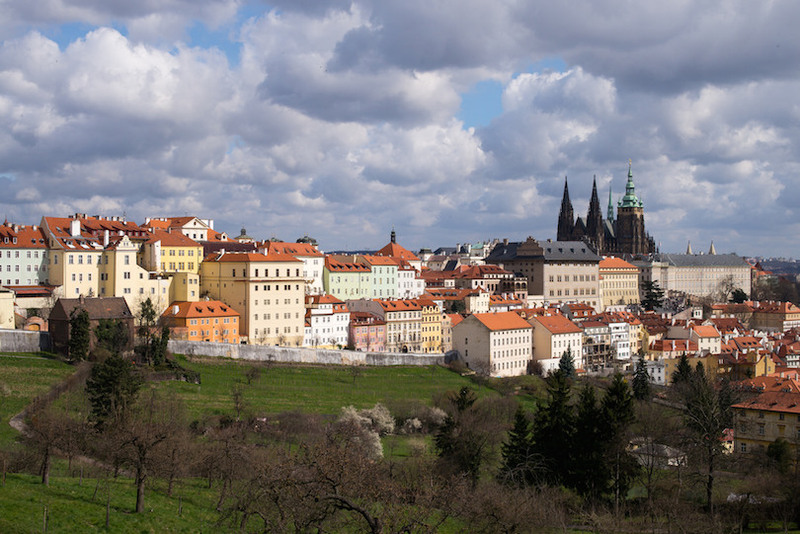 Hradcany is home to Prague Castle, one of the largest castle complexes in the world. Dating back to the 9th century, the castle totally dominates the district and Prague’s skyline, which is saying a lot since Hradcany is home to many ornate palaces. Sitting on a plateau overlooking the city and the Vitava River, Prague Castle was the seat for Czech rulers for centuries. Initially the site was used for pagan sacrifices, but no more, and, then, later, it gained fame as a market place, since important trade routes passed through. Today, it’s one of the most visited parts of Prague. The castle district is quieter with less traffic than other parts of Prague. This makes it a popular place to stay with travelers who prefer a more subdued lifestyle. While you’ll find accommodations in all price ranges, if you’re looking for luxury, the castle district is where to find it, especially if staying in medieval buildings (interiors updated, of course) appeals to you. Self-catering apartments that allow you to live like the locals are popular in this area. Wherever you stay, you’ll likely be staying in the shadow of the castle. Trivia buffs may enjoy knowing the Royal Garden was home to the first tulips in Europe. 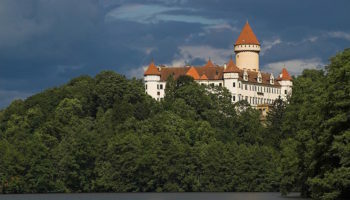 You’ll find many museums, including the National Gallery of Bohemian Art, and restaurants around the castle. Hradcany is served by both tram and metro lines at Malostranská. 1 Prague Castle – Roughly the size of seven football fields, Prague Castle is one of the largest ancient castle in the world. 2 St. Vitus Cathedral – In the center of the castle and the most important cathedral in all of the Czech republic. 3 Old Royal Palace – The original seat of Czech rulers. 4 St. George’s Basilica – The second oldest church in Prague Castle and features a colorful Baroque facade. 5 The Golden Lane – An ancient street of 11 historic houses within the Prague Castle complex. 6 Golden Well Hotel – The Golden Well Hotel is a luxurious boutique accommodation choice that boasts spectacular views over the city and its cobblestone streets. It is known for its world-class restaurant that has a terrace leading directly to the stunning Prague castle. The hotel itself is located in a 16th century hillside building next to the castle, but the rooms are the definition of contemporary. The Golden Well Hotel has served as residence for everyone from astronomer Tycho Brahe to the Emperor Rudolf II. 7 Questenberk – The Questenberk Hotel is located within a 17th century building, allowing visitors to bring the history of Prague to life. You’ll truly feel as if you’ve stepped back in time thanks to the historic decor, the exposed beams in the rooms and the inclusion of vintage armchairs throughout the premises. Views of the courtyard and the city are possible from most rooms, but the restaurant and bar are a big draw for travelers. In the lounge, relax and mingle with complimentary refreshments throughout the day. Getting to the tram and metro station involves climbing a hill. Indeed, the district’s steep hills filled with quaint alleys and stone streets make it difficult for people with mobility issues to get around. In that case, unless you plan to take taxis a lot, you may wish to stay elsewhere. Why Stay in Mala Strana? If it’s picturesque you’re hankering for, look no farther than Mala Strana, also known as Lesser Town or Little Quarter. Clustered below Prague Castle on the Vitava River, Mala Strana is filled with old burgher houses, quaint streets, and traditional Czech pubs and restaurants. Calling this area Lesser Town seems almost sacrilegious since it’s one of the loveliest and most picturesque areas of Prague. It’s got as many museums, shops and restaurants as any district in Prague. Dining at a restaurant with a river view is a good way to end a busy day of sightseeing. When it comes to eating, you can choose between typical Czech fare and fine dining. The square Malostranské is the heart of Lesser Town and has been since the 10th century. It’s also where you’ll find one of three churches named for Saint Nicholas in Prague. Dating back to 1703, this Saint Nicholas is the largest church in Prague founded by the Jesuits. Mozart played on its organs in 1787. Other buildings include the Old Town Hall and Smiricky Palace, both of which played historic roles in Prague’s history. Malostranské also is the name of the tram and metro stop, which it shares with the Castle District. Tourists crossing the 14th century pedestrian Charles Bridge from Old Town en route to Prague Castle pass through here, then go back at night. 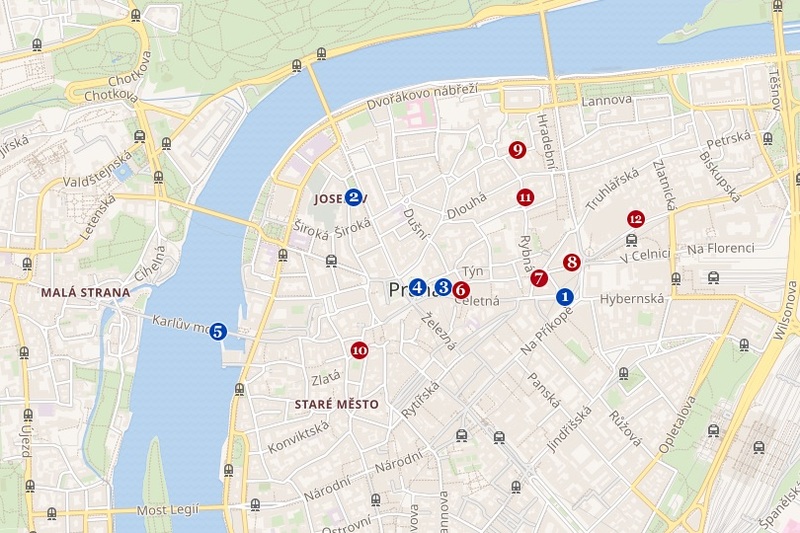 This means Mala strana doesn’t have the nightlife associated with Old and New towns. It’s quieter and just made for strolling at night where lantern-lit streets take you back in time. If quaint accommodations are your preference, you’ll love staying in a restored medieval building. The buildings retain some of their original features and ooze charm, not unexpected in a neighborhood where movies and commercials are made. 2 Malostranské Square – Forms the very center of the Lesser Quarter. 3 Smiricky Palace – Renaissance building that was built in the 17th century and became the main seat of the noble family of Smirice. 4 Franz Kafka Museum – Influences, life and works of the German language writer. 5 Petrin Hill – Affords an amazing view of the city on a clear day, and in springtime the trees are all in bloom. 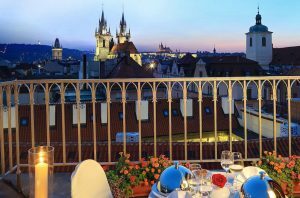 6 Aria Hotel Prague – The Aria Hotel Prague offers unparalleled luxury, and it is the ideal way to see what the nobility of the region might have experienced in centuries past. The hotel itself is located in a former theater boasting a grand, impressive design. Many of the rooms offer views of either the St. Nicholas Church or the Winter Garden Atrium. You’ll love the heated floors of the bathrooms and the sprawling suites. 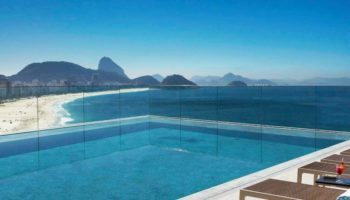 The hotel also offers world-class amenities like a private theater, a music library, an elegant lounge complete with a piano and a five-star restaurant with rooftop dining space. 7 Hotel Pod Vezi – Guests eager to be steps from many of the biggest attractions in Prague might gravitate toward the Hotel Pod Vezi, a boutique hotel that offers incredible views over the famed Charles Bridge. The hotel’s rooms are a blend of historic and modern, thanks to features as diverse as visible wood beams in the ceiling and free wifi. The Hotel Pod Vezi is very convenient, offering several dining options right on the property. Breakfast buffets are complimentary for all guests, there is an elegant restaurant with vaulted ceilings and exceptional service, and quick meals and snacks can be found at the lobby lounge and the casual country cafe. Since the streets roll up early, you won’t find the nightlife here that you will elsewhere in Prague. 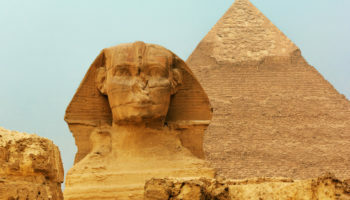 The area has a few modestly priced accommodations, but most fall into the expensive category not suitable for budget travelers. Vinohrady is a green neighborhood. Its name translates as “vineyard,” which it was in the early centuries of its existence. Vineyards covered the area from the 14th century on. Today, the neighborhood is filled with parks, including Havlíčkovy sady, which is Prague’s second largest park. Plus, you’ll find great views of Prague from, Riegrovy sady. Vinohrady is a well-to-do neighborhood filled with Art Deco houses. Many young professionals, especially expats, live here. While Prague residents are tolerant of all sexual persuasions, Vinohrady is known as the gay quarter more so than any other district. Those who depend on their daily caffeine fix will love Vinohrady. Once known for its wines, this neighborhood today has more specialty coffee houses than any other district in Prague. Because so many expats live in the district, it’s a good place to find international cuisine, including Italian, Mexican and Vietnamese. Vinohrady has its share of cultural and historic attractions. The list includes Husuc Sbor, a church with a roof made of skylights; Church of the Most Sacred Heart of Our Lord, one of Vinohrady’s most famous buildings as it was inspired by Noah’s Ark; and Vinohrady Theatre, an Art Deco treasure. Life in Vinohrady centers around Námestí Miru or Peace Square. Here you’ll find Saint Ludmilla Church, the prestigious Vinohrady Theater and the town hall. Underneath the square you’ll also find a Metro station, making it convenient to start your tour of this district. Accommodations tend to be on the high side here, perhaps because they’re found in stately old mansions. Budget travelers won’t go bedless, however, as the district has a nice selection of hostels and self-catering apartments, some of which are pet-friendly. Public transportation in this area is good, making it easy to get around to everything. 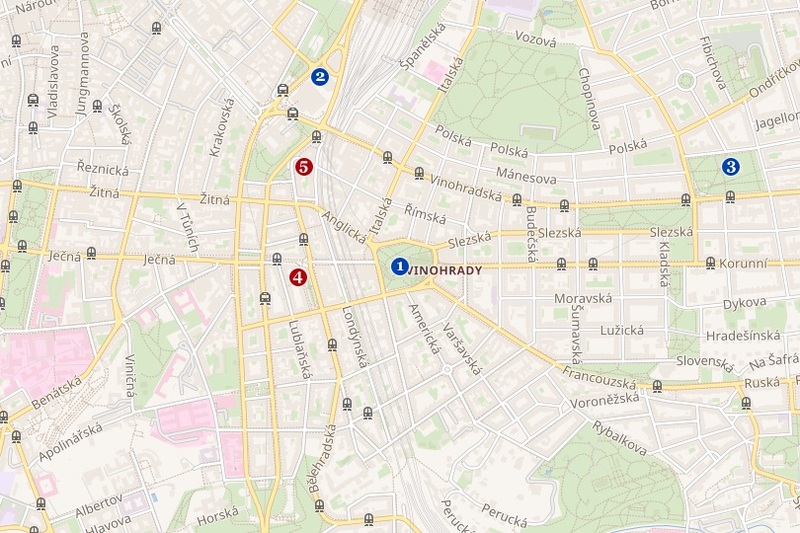 There are several stops on Metro Line A. Tram routes 10, 11 and 16 also pass through Vinohrady. 1 Peace Square – The central square of Vinohrady with a park at its center. It is dominated by the neo-Gothic Cathedral of St. Ludmila, built from 1888 to 1893. 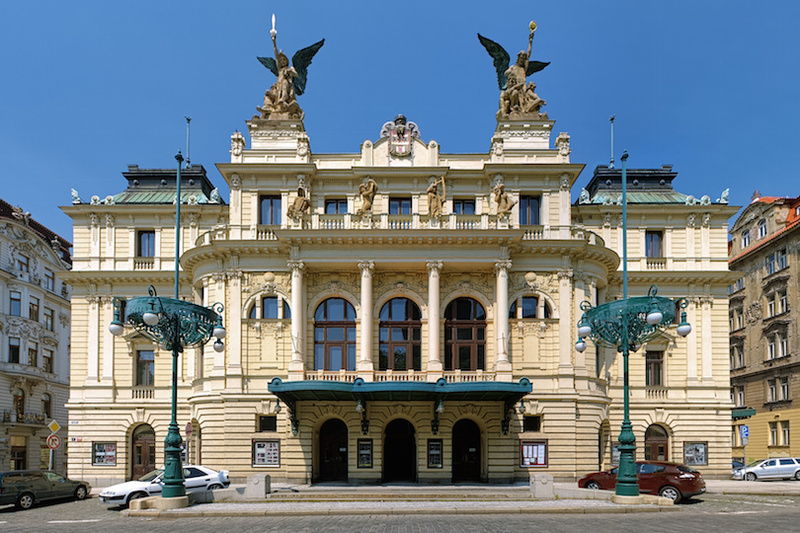 2 State Opera – A leading European opera house located in a magical neo-Renaissance building. 3 Church of the Most Sacred Heart of Our Lord – This strange train station like church was built in 1932 and is one of the most unique structures in Prague. 4 Hotel Tyl – The Hotel Tyl might be in Prague, but it has a distinctly Italian feel. The grand hotel has a historic facade, and the interior furnishings take strong inspiration from the Italian renaissance. The rooms are formal and impressively decorated, and they boast coffeemakers, televisions and wifi. Some larger suites and two-bedroom apartments are also available. If you’re dealing with jet lag, you’ll appreciate the 24-hour bar as well as the fitness room, the sauna and the ample breakfast buffet. 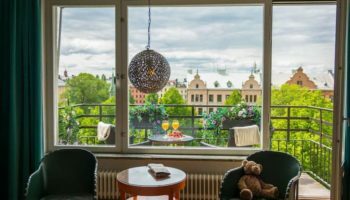 5 Royal Plaza – For affordable accommodation in Prague that is still close to the busiest and most exciting attractions, the Royal Plaza is a top pick. The rooms are outfitted well but simply, and a complimentary breakfast buffet is a fantastic way to start each day in Prague. The concierge at the Royal Plaza is available 24 hours a day, and they are happy to sell you public transportation tickets or even arrange for guided tours and special theater performances. Residents have complained about the graffiti and air quality in Vinohrady at times and the dusty atmosphere in the eastern section. Traffic can be heavy and noisy at times. Also, because it’s an upscale, well-to-do area, budget accommodations may be difficult to find. Smichov is an easy neighborhood to find in Prague since this inner-city neighborhood is just south of the Lesser Quarter. Smichov is a former industrial area where trams and beer were made. Pollution once filled its skies, but that’s all changed now as you’ll find new office buildings, shops and eateries like you would anywhere else in Prague. Andel is the district’s prime commercial and entertainment center, just minutes away from Prague city center. As one of Prague’s key transportation hubs it’s on Metro Line B, with several trams and buses running through it. A can’t miss sight here, a symbol of the area’s urban renewal, is the Zlaty Andel building, made from gleaming glass topped by an angel. A good place to shop is the Novv Smichov mall, which features remnants of a former train plant – the plant shipped trams and train cars around the world. 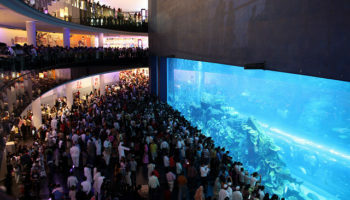 It teems with designer stores and restaurants. Window shoppers and people-watchers may enjoy a walk down Pzenska Street. Budget travelers will appreciate the many inexpensive hotels in this district, but there also are some luxury hotels for travelers with deeper pockets. 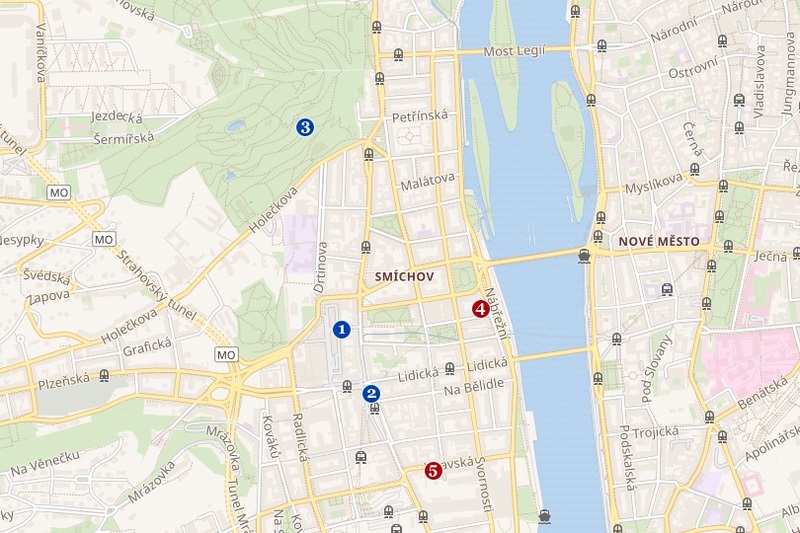 1 Novy Smichov – A vast shopping center that occupies an area the size of several city blocks. 2 Anděl – The busy center of the Smichov neighborhood. 3 Kinský Gardens – A beautiful garden located on the southern and south-eastern slope of Petřín Hill. 4 Mamaison Riverside Hotel Prague – Overlooking the waters of the Vltava River is the Mamaison Riverside Hotel Prague. Located in a breathtaking art nouveau building, the hotel is a large and comfortable hotel that offers a full range of amenities for guests. Many of the rooms and suites provide views of the city, an interior courtyard or the river, and you can enjoy perks such as complimentary breakfasts, in-room massage treatments and 24-hour room service. The Aparthotel City 5 in Prague is a straightforward, appealing place to stay that caters to those planning longer trips in the Czech Republic. The studios and one-bedroom apartments are equipped with kitchenettes and basic cooking items, allowing you to prepare meals on a budget during your stay. The Aparthotel City 5 boasts a glass sun room filled with green plants, and there is even a game room where you can mingle with other guests or unwind after a day of business or sightseeing. 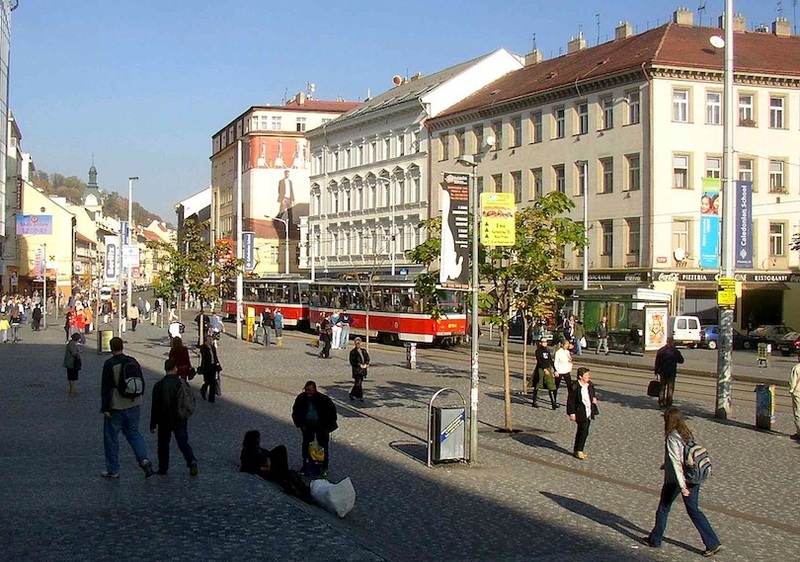 Traffic can be congested and noisy here, as some parts of Smichov have a faster pace of life. You may wish to stay elsewhere if you don’t like a lot of busy traffic or prefer a less commercial area. Also, note that Smichov has few historic attractions itself, though getting to a different area in Prague is relatively fast and easy. Karlin is one of the new communities in Prague. You won’t find quaint old buildings like elsewhere in the city since it was still rolling fields only two centuries ago. The area was developed with factories during the industrial Revolution, which brought with it air pollution now mostly cleared up. Still, Karlin has some nice green space, including Vilkov Hill with its spectacular views of Prague. The hill is a popular place for walkers, joggers and inline skaters. It’s near the National Memorial and its equestrian statue of the Hussite warrior Jan Zizka, said to be the largest of its kind in the world. Though it’s so close to everything else, Karlin is considered an off-the-beaten path place in Prague. It’s a good place to mingle with the locals and get a glimpse of everyday life. 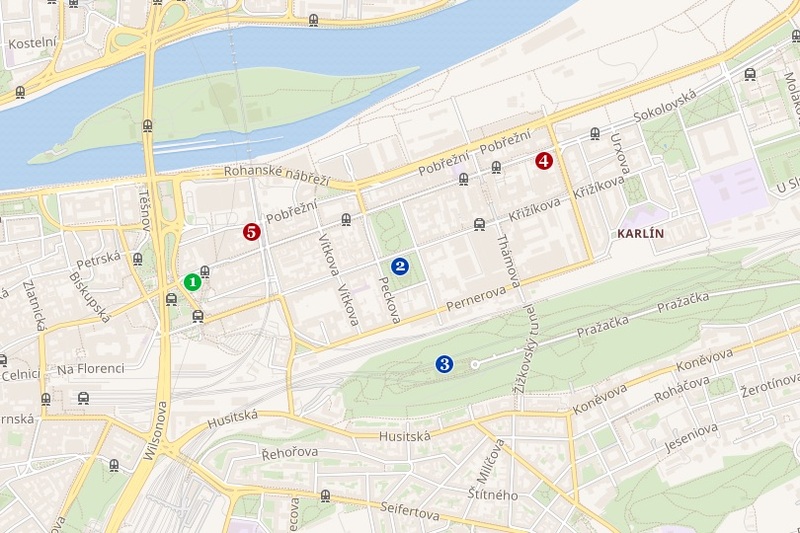 Karlin is easily accessible and within walking distance of the city center. It takes about 10 minutes to get there via tram or Metro. Karlin is basically a neighborhood of tenement housing, with its residents commuting to work elsewhere in Prague. Because it’s not a ritzy neighborhood, prices for transient accommodations are lower and more favorable for budget travelers. Short-term apartment rentals are popular. 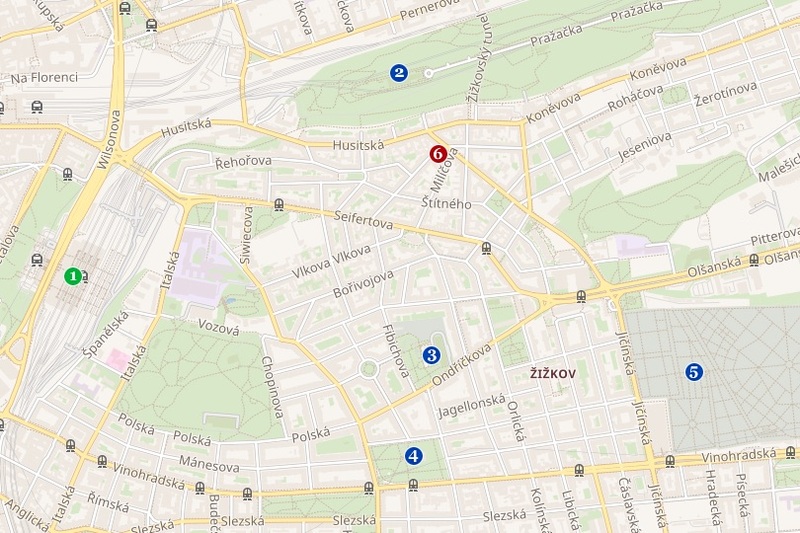 1 Praha Florenc Bus Station – The main bus station is a 20-minute walk to city center. It also has a tram and metro stop there. 2 Church of Saints Cyril and Methodius – One of the largest religious buildings in the Czech Republic. 3 Vitkov National Memorial – Located at the top of Vítkov Hill, this immense equestrian statue was erected in 1950 to commemorate Czech national hero Jan Žižkov. 4 Pentahotel Prague – If you’re looking for a hotel in Prague that is trendy, fun and vibrant, then look no further than the Pentahotel Prague. From the exterior, the hotel is illuminated with neon lights, giving it a fun and youthful vibe. Inside, prepare for rooms with sleek desks, flat-screen televisions and rainfall showerheads. To top it all off, the Pentahotel Prague has amenities like free breakfast for all guests, a game room and an impressive fitness facility. 5 B&B Hotel Prague City – At the B&B Hotel Prague City, you’ll get comfort, cleanliness and a central location. Best of all, that is all available for a very inexpensive nightly fee. Simple wood decor and neutral tones decorate the rooms, all of which include private bathrooms and free wifi. Every morning, you can start your day in Prague with a large breakfast buffet that is free for all guests. There is also secured garage parking for any guests who need complimentary parking while visiting the city. Air pollution can be a problem at times, though not as bad as when it was an industrial region a century or so ago. Because it’s newer than other districts, Karlin doesn’t have the historic features of, say, Old Town or the Castle District. In the winter, snow removal is pretty much non-existent. Bring proper footwear if you’ll be here during those months. Žižkov is well-known among Prague’s districts, more for its run-down appearance than its glamour, which is non-existent, except where it’s next to the upscale Vinohrady district. Žižkov is not all about grime however. It plays a role in Prague’s cultural life with its annual carnival and Akropolis Theater. Beer houses abound if you like a party atmosphere. Shopping and dining options are getting better all the time. It’s named for a famous Czech warrior, Jan Zizka, whose statue stands on Vilkov Hill overlooking “his” neighborhood. 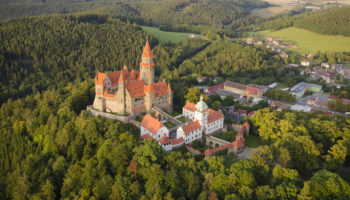 Its past goes back centuries to when Holy Roman Emperor Charles IV ordered it to be covered in vineyards. It remained a rural area until the 17th century when it was turned into the final resting place for Prague’s plague victims. The cemetery remains Prague’s largest. 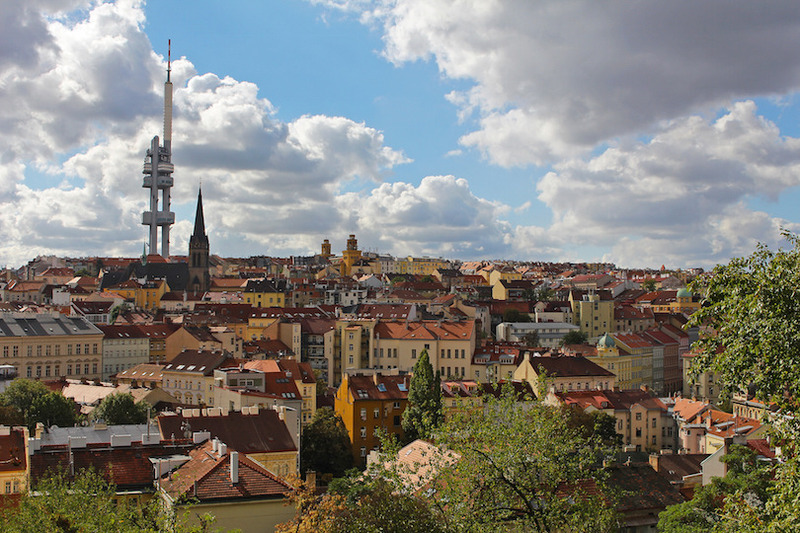 Žižkov is not without its tourist attractions, beginning with its famous television tower where platforms offer stunning views of Prague. 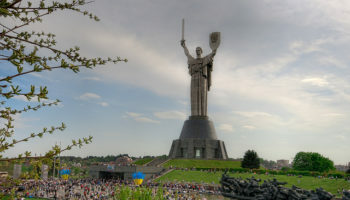 Like nearby areas, it lays claim to the humongous statue of Jan Zizka on Vilkov Hill. Olsany Cemetery, where the plague victims are buried, is worth a visit to see Art Nouveau monuments. Kafka is buried in the New Jewish Cemetery. Žižkov, a popular hangout for expats, is close to the city center. Vilkov Hill separates it from Karlin. The western part is within walking distance of the city center, Karlin and Vinohrady; you can also take a tram or subway to city center. Accommodations are affordable, probably the most reasonable in Prague, in Žižkov. This makes it a popular bedroom for budget travelers, who will appreciate the many hostels and utilitarian self-catering apartments. 1 Praha hlavní nádraží – Prague’s main railway station. 3 Television Tower – Built by the communists to jam foreign radio signals, the most hideous building in Prague offers spectacular views of the city. 4 Church of the Most Sacred Heart of Our Lord (see Vinohrady area). 5 Olšany Cemetery – The largest graveyard in Prague, remarkable for many art nouveau monuments. 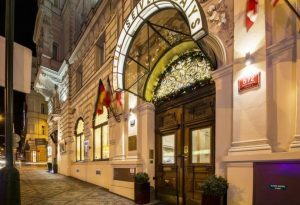 6 Three Crowns Hotel – The impressive, neoclassical facade of the Three Crowns Hotel makes it a popular subject for photographers, but it can be your home during your next trip to Prague. The rooms and lobbies are sophisticated and upscale, and all guests will enjoy complimentary wifi as well as flat-screen televisions with some English language channels. The shared spaces are popular hangout spots for guests, so be sure to try the free breakfast buffet in the large, airy restaurant as well as sip a drink from the lush garden terrace. Žižkov is polluted due to its location between a hill and a ridge. It’s better than it was, but still bad enough for residents to complain, particularly during smoggy winters. 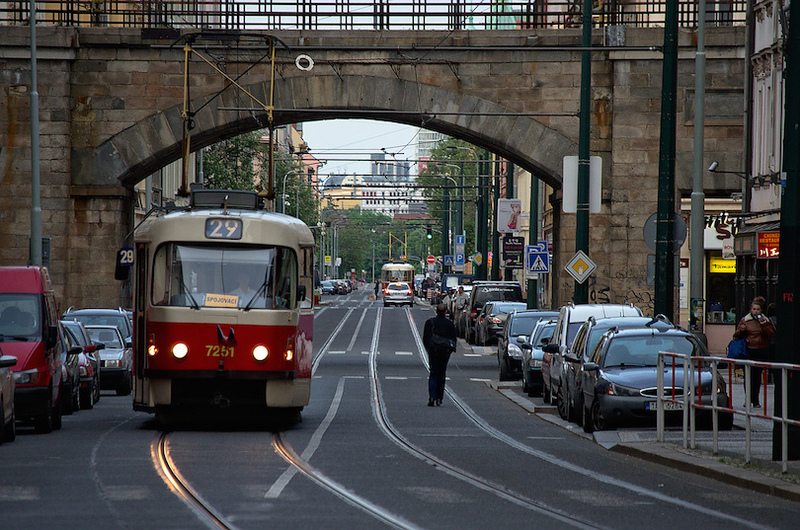 Like other areas of Prague, Žižkov suffers from noise and congestion on busy roads. The area is also a bit rundown, with much graffiti on the buildings.